Hilo Style 670 Model Hawaiian Acoustic Guitar, made by Oscar Schmidt, c. 1927, made in Jersey City, NJ, serial # 5083, natural finish, koa wood body and fingerboard. 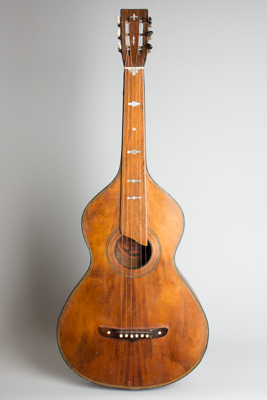 A particularly beautiful 1920s Hawaiian guitar, made not as one might expect in California like most, but in Jersey City! Dramatically grained Island woods throughout and fancy shaped abalone inlay and binding on all edges make this one beautiful-looking lap guitar. The sound is quite fine as well; perhaps a bit deeper and not as "reverby" as many Weissenborn instruments, but with a lovely rounded character. A real gem of a player's acoustic Hawaiian; well-used, well-traveled, but still regal. Overall length is 38 in. (96.5 cm. ), 15 in. (38.1 cm.) wide at lower bout, and 3 in. (7.6 cm.) in depth at side, taken at the end block. Scale length is 25 1/2 in. (648 mm.). Width of nut is 2 in. (51 mm.). This old Hilo Hawaiian has seen a lot of use, and traveled far from its original New Jersey birthplace; there is a sticker from a shop in Auckland, New Zealand on the back of the headstock! There are some very old crack repairs, and the binding is somewhat pulled up in places but still intact, with some spots amateurishly reglued. There is a somewhat sloppy but thankfully thin old varnish application over much of the instrument; the technical term would be "overspray," but this one was definitely applied with a brush! The tuners are a mixed lot -- the treble side are Depression-era Waverly strip, while the bass side are a 1950s European strip. Despite this hard life, the sound does not appear to have suffered, as it is still a lush-sounding instrument. A good player in an old Koa Hawaiian, ready for more adventures! Very Good Condition.